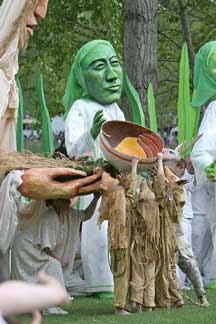 In the Heart of the Beast Puppet and Mask Theater has a number of upcoming shows. They are located on 1500 East Lake Street in Minneapolis, Minnesota. If you're unfamiliar with their shows, In the Heart of the Beast produces a few main stage productions each year. They also provide a theater for visiting artists. They also put on a weekly Saturday morning puppet show for children. If you live nearby and have children who like puppets this is a constructive alternative to having the kids watch cartoons on Saturday mornings. On October 22-25, Paul Zaloom, AKA Beakman, will be in town to put on 3 shows. On November 14 and 15, Heather Hensen, daughter of Jim Henson, will be in town to put on a few shows. On December 13-21, In the Heart of the Beast will show La Natividad. 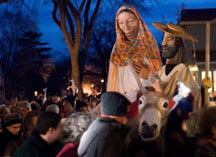 La Natividad is a uniquely mobile experience. I strongly encourage anyone who is interested in seeing one of their shows to go check them out. Finally, if you would like to support In the Heart of the Beast with a financial gift, they could certainly use it. You can see more details about giving here. Full Disclosure: My wife is an employee of In the Heart of the Beast.